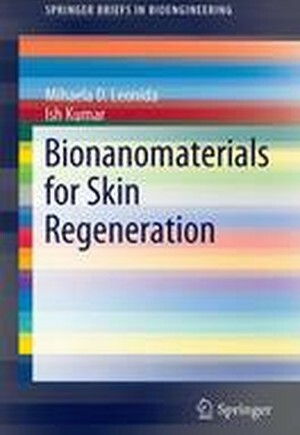 This book gives a concise overview of bionanomaterials with applications for skin regeneration. The advantages and challenges of nanoscale materials are covered in detail, giving a basic view of the skin structure and conditions that require transdermal or topical applications. Medical applications, such as wound healing, care for burns, skin disease, and cosmetic care, such as aging of the skin and photodamage, and how they benefit from bionanomaterials, are described in detail. A final chapter is devoted to the ethical and social issues related to the use of bionanomaterials for skin regeneration. This is an ideal book for researchers in materials science, medical scientists specialized in dermatology, and cosmetic chemists working in formulations. It can also serve as a reference for nanotechnologists, dermatologists, microbiologists, engineers, and polymer chemists, as well as students studying in these fields. 1. Bionanomaterials for the skin - more than just size.- 2. Bionanomaterials for the skin - more than just size.- 3. Wound Healing and Skin Regeneration.- 4. Transdermal and Topical Delivery to the Skin.- 5. Nanoparticles, Nanomaterials and Nanocarriers.- 6. Bioavailability in Delivery to the Skin.- 7. Lipid-based Nanoparticles in Cosmetic and Pharmaceutical Products for the Skin.- 8. Bionanomaterials with Antioxidant Effect for Skin Regeneration.- 9. Nanochitosan and the Skin.- 10. Nanocellulose.- 11. Bionanomaterials from Plant Sources.- 12. Nanomaterials, Scaffolds, and Skin Tissue Regeneration.- 13. Peptide and Protein-based Nanomaterials in Applications for the Skin.- 14. Nanotoxicity and the Skin.- 15. Ethical and Social Issues Linked to Using Nanomaterials in Skin Regeneration.